Who is Yasmin Sooka & exactly what is the reason for her involvement into Sri Lanka’s affairs? Is it on a personal note that she is interested or is she part of a group or organization, if so who are involved in this, are there conflict of interests, who is funding her work, who pays her are some of the questions we like to have answered. She is an EU employee and tasked to look into the welfare of South Africans where she herself is a citizen but virtually 24×7 she is preoccupied with Sri Lanka & in particular Sri Lankan Armed Forces. What is that motivates her attention to Sri Lanka so much? She is not an ethnic Tamil like Navi Pillay, who after retiring as UNHRC head is has not been involved in Sri Lanka, but Yasmin Sooka on the other hand since 2011 has been virtually obsessed about Sri Lanka…why? Yasmin Sooka is an EU employee working for an EU created entity. She is paid by the EU & function as Executive Director of the Foundation for Human Rights in South Africa which EU set up in 1996. The Foundation is funded by EU & Belgium & receives funding from Ireland CARE, UN bodies & even American Foundation. The foundation’s scope of work is SOUTH AFRICA. If EU is funding a human rights initiative in South Africa, how is it that Sooka is allowed to administer a project within the Foundation for Human Rights in South Africa called the International Truth and Justice Project – Sri Lanka (ITJP) that has nothing to do with South Africa? http://www.itjpsl.com Interestingly enough even after the hyped 40,000 to 200,000 dead allegations the ITJPSL submitted a list of only 351 missing persons names to the Office on Missing Persons in June 2018. Why have they not given names of 40,000 people they claimed were killed? Sooka herself said We still don’t know how many tens of thousands of Tamils died in the 2009 war and not one person has been held accountable” to allege tens of thousands she must have evidence! Not only is she EU employee of Foundation for Human Rights she is also Director of the ITJP(SL) administered through the FHR & churning regular reports against Sri Lanka. These reports are generally released before UNHRC sessions in Geneva & in her own words we released the report in time before the Geneva Resolution because we wanted to influence the Geneva Resolution”. The 2014 ITJP report was funded by the British Foreign Office through the Bar Human Rights Committee of England & Wales. Of the 40 selected cases most of whom were former LTTE illegal combatants seeking asylum. Sooka was one of three appointed international Commissioners to the Truth and Reconciliation Commission for Sierra Leone appointed by the Office of the High Commissioner for Human Rights. Sierra Leone is the first country where a truth commission operated alongside a tribunal. Though the TRC was a national institution, the civil society organizations that were part of Sierra Leone’s ‘elite society’ were pushing for international presence & international funding. They even wrote the TRC Act and even campaigned widely while the grassroots’ organizations were not interested though UN established the Special Court for Sierra Leone (SCSL) creating further conflicts. TRC collected over 9,000 statements. Critics cite the futility in plugging Christian faith into ‘Reconciliation’ instead of traditional ways that people can relate to. Yasmin Sooka first became involved with Sri Lanka when Ban Ki Moon the UN Secretary General appointed her as one of his personally selected 3 panel members to advise him on the last 3 months of the conflict in Sri Lanka. Report was leaked to the public in 2011. New York Times published an article by the 3 panelists Ban Ki Moon chose to appraise him of the final 3 months of Sri Lanka’s conflict months after the report was leaked. Yasmin Sooka – Marzuki Darusman & Steven Ratner’s article titled Revisiting Sri Lanka’s Bloody War” have played foul by manipulating words. In their 2011 report they say credible allegations” however months later their article to the New York Times replaces ‘credible allegations” with credible evidence” not stopping there, they write we found credible evidence that both sides had systematically flouted the laws of war, leading to as many as 40,000 deaths” Totally unethical practice. Lakhdar Brahimi – also a member of The Elders” & the Global Leadership Forum; Governing Board, SIPRI; Board of Trustees, International Crisis Group and Global Humanitarian Forum. Basil Fernando – Executive Director of the Asian Human Rights Commission (AHRC) and the Asian Legal Resource Centre (ALRC). Bianca Jagger – a member of the Executive Director’s Leadership Council for Amnesty International USA, the Advisory Committee of Human Rights Watch America. Amnesty International accepted $50,000 from Canadian Tamil Congress also designated as a LTTE front by the GOSL under UNSC Resolution 1373. While former Executive Director Ian Martin even held workshops for LTTE judges” in 2003. Yasmin Sooka guest speaker at Global Tamil Forum (proscribed as a LTTE front by GOSL in 2014) conference in UK where she was introduced as ‘comrade’. TNA’s Sambanthan & Sumanthiran were also present & other speakers included Yolanda Foster of Amnesty International, Dr.Elvira Dominguez Redondo expert of R2P, Prof. William Schabas who endorsed the 2014 report against Sri Lankan forces by Sri Lanka Campaign for Peace & Justice and who was also in the C4 1st video. Yasmin Sooka said Sri Lanka is quite frankly descending into a state where the rule of law no longer holds sway.” She praised Canada for saying it would boycott the November CHOGM meeting unless Sri Lanka investigates suspected war crimes. Yasmin Sooka joined Desmond Tutu, Bishop Rayappu Joseph, R Sambanthan, C V Wigneswaran & 35 others to write to the UNHRC to set up a Commission of Inquiry to investigate war crimes & crimes against humanity committed by Sri Lanka. She was the 2nd signatory. Sooka is a member of the Advisory Council of SLCPJ. Crimes against Humanity in Sri Lanka’s Northern Province” forward of the report was by Centre for Justice & Accountability & no surprise Yasmin endorses it. Also endorsing the report was UN Special Rapporteur on Torture Juan Mendez, former UN Special Rapporteur on Torture Manfred Nowak, and international criminal law and human rights law scholar Professor William Schabas. Yasmin Sooka wrote an article to the Mail&Guardian ‘Sri Lanka: Living in Fear of the White Vans” http://mg.co.za/article/2014-03-31-sri-lanka-living-in-fear-of-the-white-vans. That she has an overactive imagination was revealed when she writes All the indications are that the Sri Lankan government now has sophisticated facial recognition software for identifying those of interest. They also have an extensive database now of Tamils from the former conflict areas to which they can match photos. Every survivor of the war was photographed, their personal details recorded in the giant internment camp in 2009. We now know that it’s standard operating procedure for the security forces to photograph and fingerprint all those they abduct illegally in white vans”. This includes often photographing their bodies for scars from the war or previous torture sessions.” Can she please name all those who disappeared in white vans? Yasmin Sooka & the 2 other members of Ban Ki Moon’s Panel in their report claimed ‘credible allegations’ that 40,000 ‘may have died’ which is poles apart from 40,000 having been killed and that too only by the Sri Lankan Forces as is being spread. Even Navi Pillay as UNHRC head quoted 2800 deaths in 13 March 2009 (37 days before LTTE was militarily defeated) The UN country team figure of dead was 6432 by 24 April 2009. Sooka & her team in 2011 quoted the UN source saying 7721 had been killed between August 2008 and 13 May 2009 (10 months). How the hell did 40,000 get killed in 5 days (13 May to 19 May)? Sooka seems to have also conveniently forgotten to mention & give credit to the Sri Lankan Army for bringing to safety close to 300,000 Tamils among whom were LTTE combatants excluding the close to 12,000 LTTE combatants that surrendered in civilian clothing. Yasmin Sooka also is on the George Soros Human Rights Initiative Board. Has Sooka visited Sri Lanka? Who are these sources that she is citing? Have they visited Sri Lanka and what are their bonafides? 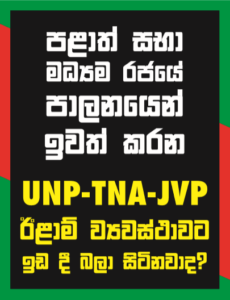 Do they have connections or links to LTTE fronts operating from overseas, if so their claims cannot be accepted without reasonable doubt & conflict of interest! Both Sierra Leone & Timor-Leste TRC & Tribunals are considered hopeless failures. We do not wish to see Sri Lanka knowingly enter that same failure list as a result of trumped up charges & based on well-funded campaigns & reports by a same set of people who appear to be circulating around the international bogey of human rights accountability, justice, reconciliation & a whole list of other terms that they keep flagging to get media attention for themselves projecting themselves as the cats whiskers to solve the world’s ills though they have no feather on their cap except dishing out awards & praises upon each other.